Between 2010 - 2015, we lived, worked and toured out of three separate vehicles that we converted to run off of waste veggie oil and solar panels. This is the 3rd vehicle we converted to run on waste veggie oil. It's a 1994 Thomas Vista with an International DT406 (all mechanical) diesel engine. We bought the bus in April of 2015 and I did the conversion myself. We upgraded to a school bus in the fall of 2011. It was nice 'moving into' a school bus. So much room, compared to a cargo van!! 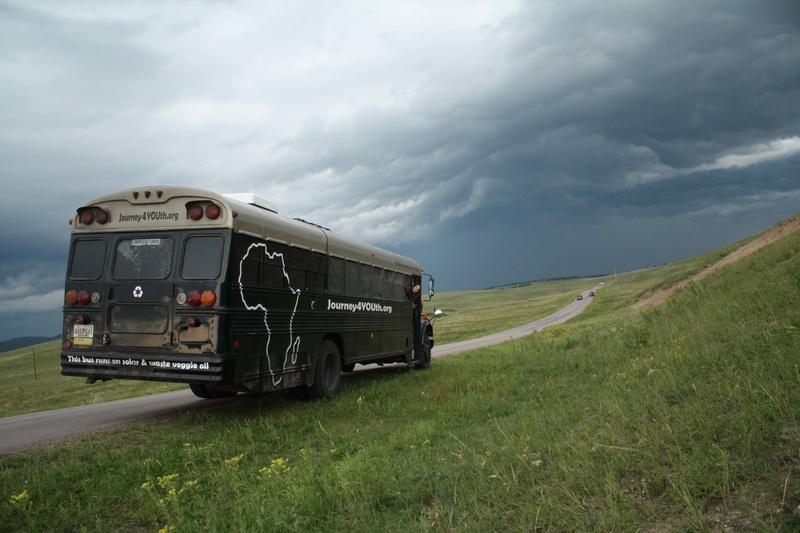 In August of 2012 we invested $3000 to convert our bus to run off waste vegetable oil. As of September 2014 we've collected over $20,000 in waste veggie oil!! Below is a short video from our 2012 summer tour. It kind of shows how we pump and collect our fuel. Also, below that is another video from our 2011 summer tour (when we were touring in a van) that shows how to convert a Ford 7.3L diesel engine. The first vehicle we converted to run off waste veggie oil was Clifford, the big red van. It was a 1989 Ford E350 (7.3L diesel engine w/ duel fuel tanks). Clifford did a couple cross country tours in 2010 and 2011 as well as a south east run in 2012 (all on veggie oil). It was our first van (and home) together and we learned and saw a lot of Clifford. Eventually he died at a post office in Florida. We already had "Nelson" the veggie van (aka magic bus) ready to go.